Launceston head coach Mike Lewis highlighted individual errors as the main reason his side suffered an eighth consecutive loss. 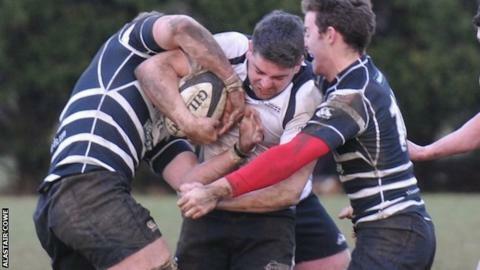 After falling to a 20-16 loss at Dorking, the Cornish All Blacks are bottom of National Two South having picked up just three points. "Our individual errors cost us," Lewis told BBC Radio Cornwall. "Giving away silly penalties and making silly errors instead of just backing ourselves." After suffering losing margins of at least 25 points in their first six games, Lewis believes the four-point loss demonstrates an improvement, with the side not too far off claiming their first win. "This game was ours for the taking," he said. "It's been the only time we've been in with a winning shot at half-time this season - we have been 20 points behind in every other game. "We started well and if we had continued that way throughout the game we would have been fine, but we started changing things and tried to do things a little bit different and it went wrong. "As of three weeks ago there was a margin of 30 points, now it's four. We are there or thereabouts, it's just about being clinical enough until the end."